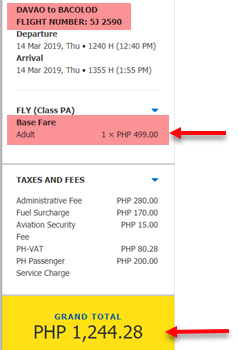 Here are the latest Cebu Pacific promos as low as P499 base fare from Davao! This promo features sale tickets to/ from Davao, Iloilo, Zamboanga and other places in Visayas and Mindanao. 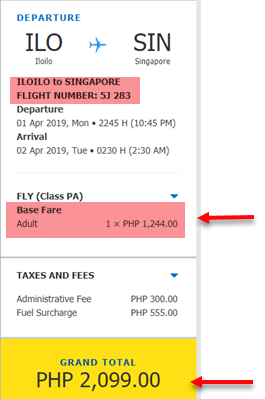 Avail affordable fares as low as P499 base fare Davao to select domestic destination and P1,244 base fare to Singapore from Davao or Iloilo. Base fare promos cover the fare only and 7 kilos hand carry baggage. Other fees like Web Admin Fee, taxes, Fuel Surcharge and Terminal Fees are not included in the promo rate. 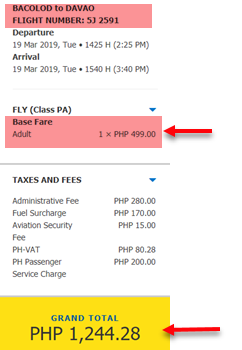 Book Cebu Pacific promo tickets until January 22, 2019. 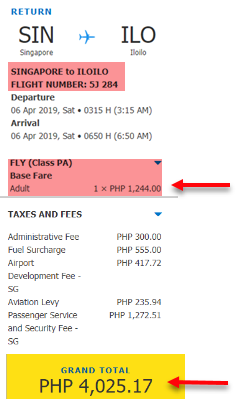 Shared below sample booking for Cebu Pacific promo fare Davao to Bacolod/ vice versa. Book the low fares online at www.cebupacificair.com. Promo Code not needed in booking. Book online and pay in cash. Check How to Pay Tickets Booked Online in Cash. 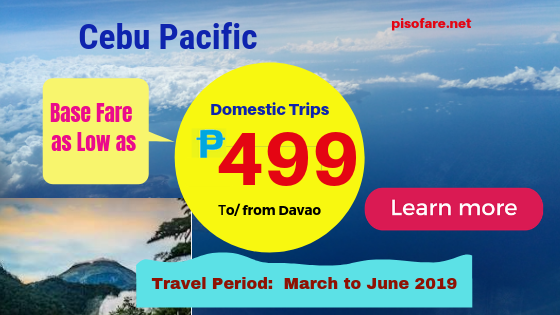 Buy the affordable fares at Cebu Pacific ticket offices in various areas in the Philippines. Call Cebu Pacific Reservation Hotline to reserve tickets. Please be reminded that you need to present a valid ID when traveling to local destinations and a valid passport, Visa, other required documents for travel to Incheon. Hong Kong and Singapore do not require visa as these countries are among the countries that do not require visa for Filipinos. As there is no baggage allowance included in Cebu Pacific promo ticket, you may purchase Checked Baggage Allowance in advance to save on baggage fees. Book your tickets now. Cebu Pacific promo tickets are limited and may not be available on all flights! In case your desired destination is not covered on this promo, please wait for our promo updates as we will share these in our Facebook: PISO FARE TICKET!